There’s no scale to interpret the quantities. And if one fruit in each row is supposed to represent a given quantity, then banana and apple have the same frequency, yet banana looks like its frequency is much greater. 90% of 15 is 13.5, 80% is 12, 70% is 10.5, and 60% is 9. 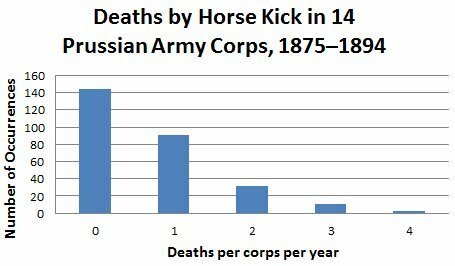 (a) The variable is discrete, “number of deaths in a corps in a given year”. Alternatives: Some authors would draw a histogram (bars touching) or even a pie chart. Those are okay but not the best choice. 7 (a) Bar graph, histogram, stemplot. 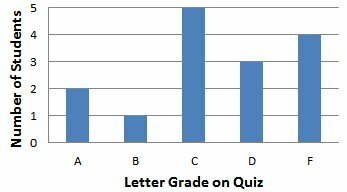 A bar graph or histogram can be used for any ungrouped discrete data. (Some authors use one, some use the other. I like the bar graph for ungrouped discrete data.) A stemplot, or stem-and-leaf diagram, can be used when you have a moderate data range without too many data points. (c) Bar graph, pie chart. 9 (a) Group the data when you have a lot of different values. (b) The classes must all be the same width, and there must be no gaps. The bars are labeled at their edges, not their centers, because this is a grouped histogram. (b) 480.0−470.0 = 10.0 or just plain “10”. Don’t make the common mistake of subtracting 479.9−470.0. Subtract consecutive lower bounds, always. 5 June 2014: Fix a typo, thanks to Kathleen Kelly.